A cracked toilet is often a confusing plumbing problem because the cracks are not always easy to spot. In some cases, a crack may have occurred when the toilet was first manufactured, but it does not surface for many years. Other times, a toilet can mysteriously develop a crack at any time and start leaking. More obvious cracking can occur due to an extreme temperature change, causing a crack that goes all the way through the porcelain. Whatever the cause of the crack, the first step toward a repair is locating the crack and assessing whether or not it can be fixed (or at least attempted). Hairline cracks often can be patched with a porcelain epoxy. Larger cracks or cracks through a bowl usually cannot be repaired, and the toilet must be replaced. A toilet tank can have cracks above or below the water level and on the inside or outside. Where the crack is located will determine what action is needed. A crack above the water level is usually not a problem unless the crack grows slowly. If you spot a toilet crack in the tank, mark it and keep an eye on it to make sure it doesn't get any worse. It can be useful to take a picture of the crack to refer back to in the future. A crack in the tank that is below the water level will have to be fixed. Unfortunately, a toilet tank crack can be hard to spot. If you suspect a leak from the toilet tank, start by checking the seals between the tank and the bowl. Next, check the tank carefully for a crack in the porcelain. You may have to look on both the outside and the inside of the tank to see it. A cracked toilet bowl is more difficult to narrow down. Keep in mind that the leak may only occur when you flush the toilet, so flush while you check around the bowl for leaks. If you find water on the floor near the toilet, a leak in the bowl is a possibility. It's a good idea to check for cracks in the bowl on a regular basis as well. A toilet bowl crack above the water level will need to be monitored. If you find a crack in the bowl that does not leak at all because it's near an area that does not have water going through it, you might be all right leaving it. Mark both sides of it to make sure it's not growing. A picture can also be very useful for future reference. A crack in the toilet bowl below the water level is much more complicated. The source may be almost impossible to track down because of the shape of the toilet bowl. When the toilet crack is visible in the part of the bowl that retains water, you'll probably need to replace the toilet to stop the leak. An invisible crack is also a possibility that can present in two ways: standing water outside of the toilet and missing water. A small invisible leak can cause water to settle on the floor at the base of the toilet. In a less common scenario, the water from the toilet bowl will slowly leak out into the drain instead of onto the floor. If the toilet bowl doesn’t seem to be able to hold water, you could have a cracked toilet that leaks into the drain. If you have a hairline crack in the tank or the bowl, you may be able to stop the leak by sealing the crack with a waterproof epoxy. Epoxy can also be effective for cracks at the base of the toilet, such as cracks or breakage around the bolts that secure the toilet to the floor. Cracks under the water line in a toilet bowl are more challenging, but you can try an epoxy for this before replacing the toilet. It that doesn't work, replacement is the only option. Waterproof epoxy comes in two parts that you mix together immediately before applying. Most epoxies have only 15 to 30 minutes of working time before the material begins to harden. 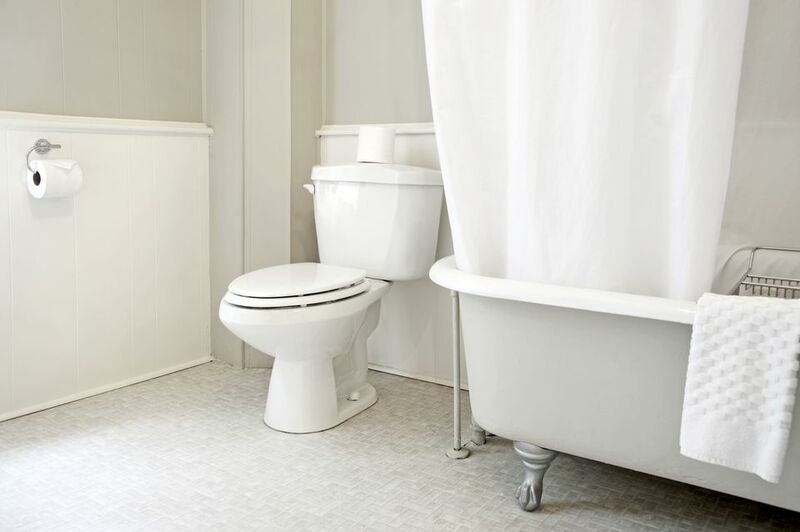 Choose an epoxy rated for porcelain tubs and sinks, in a color that is as close as possible to your toilet. Turn off the water supply to the toilet at the shutoff valve below the toilet tank. Turn the valve clockwise until it stops. Flush the toilet to drain water from the tank and bowl. Remove standing water in the tank or bowl, if necessary, by soaking it up with a sponge and wringing it out into a bucket. Mix the two parts of the epoxy as directed by the manufacturer. Immediately apply the mixed epoxy to the crack with a putty knife or spreader. Smooth and flatten the epoxy as much as possible for the best appearance. You must apply the epoxy during the material's working time, usually no more than 30 minutes. Let the epoxy cure overnight, or as recommended by the manufacturer. Open the shutoff valve to the toilet by turning its handle all the way counterclockwise. Let the toilet tank refill, then flush the toilet and check for leaks.